The 50mm ramp sections are for a 10 mph speed limit or less. Manufactured from heavy duty recy.. The 50mm sections are for a 10 mph speed limit or less. Manufactured from heavy duty recycled p.. The 50mm sections are for a 10 m.p.h speed limit or less. Manufactured from heavy duty recycle.. The 70mm sections are for a 5 mph speed limit or below. Manufactured from heavy duty recycled .. The 70mm end sections are for a 5 mph speed limit or less. Manufactured from heavy duty recycle.. The 70mm end sections are for a 5 mph speed limit or less. Manufactured from heavy duty recycl.. These speed ramp fixing bolts are for securing the speed ramp sections to a concrete surface. 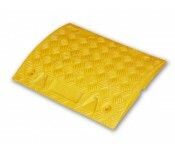 M..
At Manchester Safety, we stock a large range of plastic speed ramps which help improve traffic management due to the highly visible material. Our 50mm & 70mm speed ramps can be used as a temporary or permanent solution and depending on the size which are purchased they can be used in 10 miles per hour areas. These speed ramps are perfect for construction sites, in road work sites & car parks. These speed ramps can help improve the traffic management around a specific area and can be useful to use speed ramps with other traffic management tools such as Temporary Road signs to help enforce the speed around a specific area and also Road Marking equipment to help guide drivers around a specific site.